Ridley Scott's follow-up to the divisive Prometheus is considerably at odds with its predecessor; The Counsellor is a godless, sleek, nasty, and thoroughly mean-spirited sort of film. Penned by author Cormac McCarthy (No Country for Old Men and The Road), the story revolves around an unnamed "counsellor" who is a first-time mediator in a major drug deal. Fassbender is predictably right for the role as a well-dressed, wealthy young lawyer, arrogant and decidedly too smooth for his own good. His business partner, a perma-tanned druglord played by Javier Bardem, has a truly reptilian girlfriend in the form of Cameron Diaz, a leopard-print bedecked career criminal with the tacky aesthetic of Donatella Versace. When fatal errors are made, the Mexican drug cartel looks for someone to blame, and that blame lands squarely on the heads of anyone involved. As we might expect from McCarthy, the dialogue has a genuine flair for the poetic, the blackly comic, and the philosophical; the film moves through a collection of conversation pieces, each existing unto itself, loosely fashioned into an action thriller's narrative. Much of the critical backlash against the film has been in response to the lack of backstory, characterisation, or extended exposition, but it is often riveting precisely for its ambiguity; it remains involving on a moment-to-moment basis, where explanatory flashbacks would likely feel clumsy. The verbose dialogue is countered by the ramped-up excess of the film; the crass, sleazy, sexually predatory characters who people it; glistening skin, sparklingly modern apartments, fast cars; sheer visual vulgarity. Cheetahs lope gracefully out of smashed-up black Range Rovers; deaths are spectacular and ruthless; beheadings and mutilations leave shivering wrecks of individuals, choking in terror on their own snot. As a weary Mexican barman tells Fassbender, the cartel kill to show that "death has no meaning," - but no one truly believes that, he hastens to add. This is the internal logic of The Counsellor in full - death has no meaning. Nor does life, nor guilt, nor innocence. None have a bearing on the turn of events set into motion by the counsellor's greed and complicity. Such unrepentant nihilism is unusual in a film with stars of this calibre, and it is decidedly untrendy in terms of the box office. The Counsellor does hit a few sour notes; it is too grandiose to not feel faintly ridiculous at times. It is understandable that some may find the writing style pompous. Bardem's persona is slightly too determinedly wacky, and Diaz is sometimes cartoonish, played a bit too far against type to always be believable. But Fassbender's lion's share of screen-time, in my view, more than makes up for the others' weaknesses - as does the almost apocalyptic tone. Ultimately, the terrifying, serpentine emptiness at the centre of The Counsellor makes for fascinatingly morbid viewing. 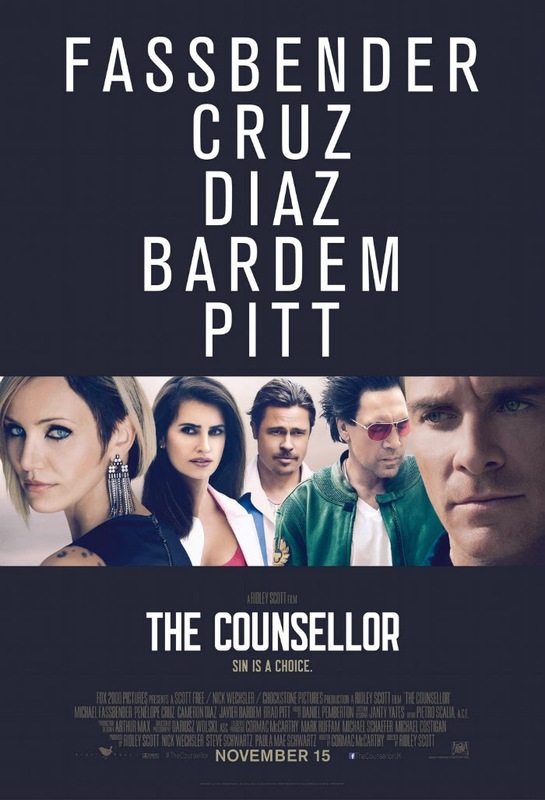 To do business with and be left untainted by the vast evil of the faceless Mexican drug cartel is a tall order, indeed - and it's a task that the counsellor himself may or may not be up to handling.